National strategies in England to improve literacy, numeracy and schools boosted learning, but suffered because of "initiative overload", Ofsted says. 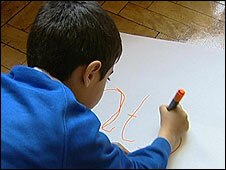 The £4.5bn national literacy and numeracy strategies were backbones of Labour's early primary school reforms. But programmes were not evaluated fully before new initiatives were thrust on to schools, and thus improvement had slowed in recent years, Ofsted said. The government said it was not sorry for focusing on the "Three Rs". Teachers' unions have often complained of initiative overload and too much meddling from central government and Ofsted's report supports that. Schools suffered because of the "frequent introduction of initiatives, materials and guidance" which led to "overload" and diminished the effectiveness of each individual initiative, Ofsted said. "Taken together, national agencies, including national strategies, provided a very considerable number of diverse, changing and sometimes overlapping programmes. "Systems for communicating with schools and local authorities did not help them to have a good understanding of the coherence of different initiatives," it added. As one head teacher put it: "We often have to move to a new initiative before we know the impact of those we have just worked on." Ofsted's report, The National Strategies: a review of impact, comes as the national strategies are beginning to be phased out. But its publication just a few weeks ahead of the general election may also be seen as an audit of Labour's early attempts to improve schools, most famously through the introduction of literacy and numeracy hours. Where used well, the report said, the principles promoted by national strategies were drawn on by good teachers, honing their skills. But where teachers were weak, their execution was less effective, it said. The national strategies were only as good as the staff delivering them, the report said. Although the programmes had improved teaching and learning, they did not make up for weaknesses in basic teaching skills in many schools. Ofsted chief inspector Christine Gilbert said the national strategies had been at the forefront of improving teaching in the core subjects. "However, improvement has been too slow over the last four years and this report finds the potential effectiveness of the strategies is much diminished," she said. "From next year, when the national strategies come to an end, there will be greater devolution of funding and responsibility for improvement to schools. "It's important we learn from what worked well in the National Strategies and ensure pupils continue to benefit from high quality programmes." Schools minister Vernon Coaker said: "A relentless focus on the Three Rs, coupled with record investment and rapid intervention, has led to the highest ever school standards - and Ofsted's report is clear that the National Strategies have made a real impact on teaching and learning. "And the figures speak for themselves. We've leapt from 17th to 7th in the international league tables for maths and around 110,000 more children now leave primary school secure in the basics than in 1997. "It's true that, while secondary results continue to improve, primary results have stabilised - and we're determined to get them rising again." Ofsted called for fewer initiatives, more evaluation and more time for schools to implement such initiatives. What are the national strategies?